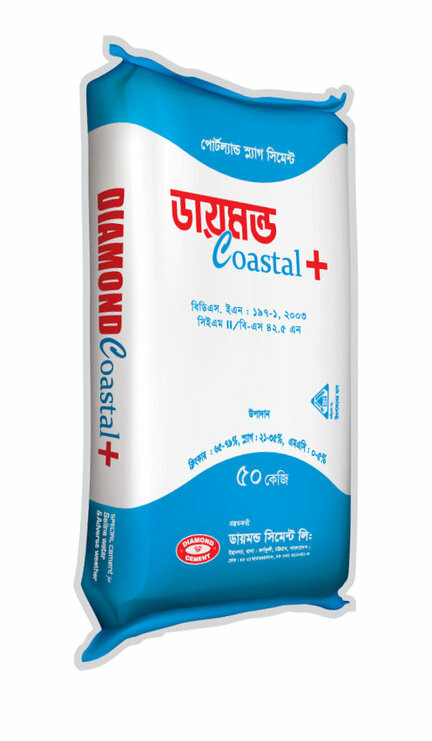 Diamond Coastal Plus cement cement does not contain C3A and produced more CSH [Calcium Silicate Hydrate] decreases the production of Ca(OH)2 during its hydration process, which protect Ettringite compound formation in concrete and thus there is no chances of tensile stress and sulfate attack in salty environment. In hydration process, Portland Slag Cement reacts with water and calcium hydroxide Ca(OH)2 to form additional CSH gel. CSH is the glue that provides strength and holds concrete together with reinforcement [Rod] and resulting in lower permeability.Lower permeability reduces chloride-ion and other air access to the RCC and thus reduces the corrosion of inner structure. Clinker is the basic raw material of cement. When slag is used as a part of cementitious material in a concrete mix, it reacts with water and Ca(OH)2 to form more Calcium Silicate Hydrate (CSH) gel. CSH is the glue that provides strength and holds concrete together. The additional CSH densifies the concrete matrix and enhances strength. Usage of 65-79% clinker in Diamond Coastal Plusand its additional CSH gel from Slag, increases 15% more strength in 91 days than other cements. It is most difficult to control inner temperature of mass concrete between surface temperatures during its hydration process. These unbalanced temperatures may create “Thermal cracks”. Diamond Coastal Plus can mitigates this high inner temperature by producing more CSH gel and reduce the possibility of thermal cracks. Blast Furnace Slag is a calcareous and alumino-silicate compound like Clinker. It does not contain carbon; so that it has no ability to attract moisture and hence there is no chances of dampness of concrete structure. Mass Concrete Foundations,Waterdam,Reservoirs or any other hydraulic structure which require low heat of hydration. Marine Concrete Structure exposed to Sea Water & Sulphates. Bridge, Jetty, Bored Piles& any other submerged structure in coastal zone. Concrete which may consist of Alkhali reactive aggregates. High strength Pre Cast & Pre stressed concrete. Copyright � 2017 Diamond Cement, All Rights Reserved.